In 1990 the then Chairman of British Gas, Robert Evans, wanted a major sculpture positioned outside their then headquarters building on the corner of Vauxhall Bridge, very nearly opposite the Tate Gallery, originally the Rank Hovis MacDougall building. Of course to have a work so prominently placed in central London was every sculptor’s dream and so when Derek Portsmouth arranged a meeting with Robert, I was delighted and was duly commissioned to produce a series of smallish maquettes from which the final work was chosen. Then it was how to enlarge the sculpture to about 7 metres in height. I worked with Auriol Pace and her Father Roy and in their garden in West Ashling and after considerable technical difficulties, we made one of the five fins with yacht building materials. The pattern was finalised by Montagues, the well known pattern makers in Slough and then an associated firm produced an armature in steel to support the pattern which was used to make the 5 fins. The cast sections for each fin then had to be made and welded to the armature, each of the fins having 6 castings, so thirty in total. Very very careful chasing was necessary to get perfect lines up the whole length of the sculpture and of course the finished work showed no joins whatsoever. HRH Prince Charles The Prince of Wales had agreed to unveil the work and we had landscaped the front of the building beautifully. Sadly for us, at the very last minute there was a hitch when the British Gas chairman had a massive rise in income and was hounded in the British press as the very first ‘FATCAT’. He telephoned me with the news and asked “Had I seen ‘The Sun’?” I hadn’t! It was desperate… the sculpture was manufactured and ready for delivery and then immediately cancelled in case there was a shareholders revolt! 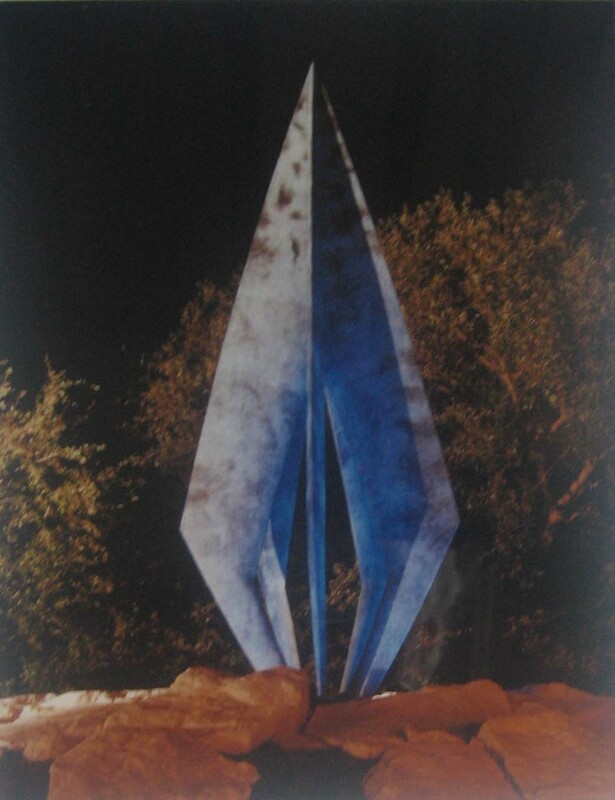 However calm eventually prevailed and subsequently there were two castings made, beautifully patinated a greeny blue colour, and clever lighting design from a pit below the sculpture made The Flame seem to flicker like a real gas flame. They looked particularly amazing at night. The first work was installed at Reading at Thames Valley Park in front of the middle of three British Gas Exploration and Production buildings which we once again landscaped. It was dedicated by John Redwood, the MP for nearby Wokingham. The second work, a year later was installed in between the University and the British Gas Research and Development HQ in Loughborough. These were major works for the team at the foundry, with the technical work alone costing over £100,000 per casting.